Major Ukrainian Air Base In Crimea Handed Over To Russia : The Two-Way One of the last important military installations in the region that was still at least partially under Ukrainian control is now firmly in Russia's hands. A Russian military officer, left, talks to Ukrainian Col. Yuli Mamchur before the Russian takeover of an air base near the Crimean town of Belbek on Saturday. Russia's grip on Crimea was further solidified Saturday when its forces took complete control of a Ukrainian Air Force base in the town of Belbek, NPR's Gregory Warner and Reuters report. The landing field and other key sections of the air base had been taken over by Russian forces previously. The section handed over today was where Ukrainian soldiers and their families lived, Gregory reports. As has happened at other strategic locations where Russian forces and local "self-defense" militias have confronted Ukrainian troops, it appears that the outgunned Ukrainian soldiers offered no resistance. One Ukrainian was reportedly injured during the takeover and witnesses said they heard some shots being fired into the air. At one point, according to Reuters, unarmed Ukrainian soldiers lined up, with their backs turned, as the Russian forces took control. 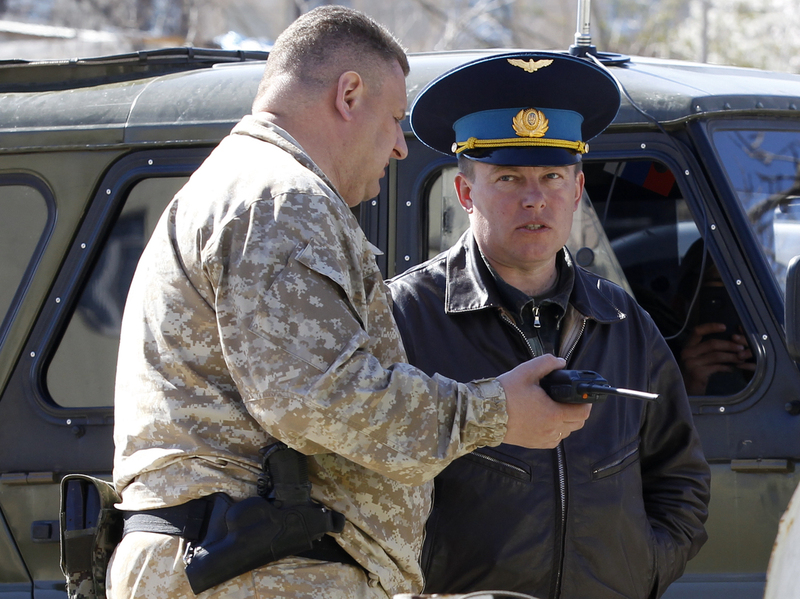 Photos showed a Russian officer talking with the Ukrainian commander, Col. Yuri Mamchur before the takeover. Mamchur has gained some fame in recent days for being "the man who stood up to the Russians." In a YouTube video last week, he appealed to his commanders in Kiev for clear orders about what to do and said he and his troops might be forced to fight if the base was invaded. Gregory reported on Weekend Edition Saturday that the incident seemed to be handled "very professionally" by the Russian and Ukrainian forces. An ambulance, he says, followed the Russian forces on to the base to handle any injuries. Ukraine's new government has said it plans to withdraw its forces from Crimea, even though it views Russia's annexation of the region as a violation of international law. News about the incident at the air base comes as there's word that Russia has agreed that international monitors may enter other parts of Ukraine to monitor developments and hopefully ease tensions there. Crimea has been the focus of attention as the ripple effects of the protests that led to last month's ouster of Yanukovych have spread. Shortly after Yanukovych was deposed and fled Ukraine, Russia moved to take control of Crimea by sending thousands of troops there to secure strategic locations. Along with "local defense forces," those soldiers surrounded Ukrainian military facilities. This week, after Crimeans voted to join the Russian Federation, Russian President Vladimir Putin signed a treaty to annex the region. The U.S. and European Union have objected, calling that action a violation of international law. Putin says he is supporting Crimeans' right to "self-determination." "The protests were sparked in part by the president's rejection of a pending trade treaty with the European Union and his embrace of more aid from Russia. Protesters were also drawn into the streets to demonstrate against government corruption." It was after Yanukovych left Kiev and headed for the Russian border that troops moved to take control of strategic locations in Crimea.